Posted on Mon, Jan 16, 2012 : 7:12 a.m.
Members of the public are invited to hear a talk about the newly reconstructed Argo Dam headrace and other related issues at a forum Wednesday night. The dam bypass channel on the Huron River recently underwent a major transformation as part of a $1.17 million project funded by the city of Ann Arbor. Donald Gray, professor emeritus of civil and environmental engineering the University of Michigan, and Joe O’Neal, principal of the O’Neal Construction Co., are expected to present a talk on the modified headrace at 4:30 p.m. Wednesday. This was the design for the new Argo Dam headrace, which includes a series of drop pools along the bypass channel. The meeting takes place inside Room 2355 of the GG Brown building, 2350 Hayward St., on U-M's North Campus. The building can be entered off Hayward Street near Beal Avenue. Parking is available at public pay lots on Hayward Street. "A novel bypass was constructed below Argo Dam on the Huron River. The bypass provides a way around the dam for thousands of canoes and kayaks that annually make the trip downriver from Argo to Geddes Ponds. The bypass consists of a series of connected, stepped-pools that start at the impoundment behind the dam and gradually descend, eventually discharging to the Huron River below the dam. The pools have replaced a former headrace canal that supplied water to a hydropower station below the dam. The headrace canal was held in by an earthen embankment that paralleled the river. "The stability of the embankment and the adequacy of drainage measures became an issue in a controversy that arose as a result of efforts by some to remove the dam altogether. Other geotechnical considerations arising from this controversy include the fate and flow direction of the Huron River, and the need for river training measures, if the dam were to be removed. "Both presenters were heavily involved in efforts to save Argo Dam and to promote a bypass around the dam for canoes and kayaks. They will jointly discuss these efforts and describe features of the new bypass." Thu, Mar 1, 2012 : 8:32 p.m.
Those pesky environmentalists, and people who live downstream or upstream. Why can't they just fade away, eh? Ann Arbor has long taken pride in its 140 parks. I am gratified to see that this improvement to one of our potentially greatest park areas has this outcome. Over on the Washtenaw Biking and Walking Coalition forum, the cyclists are very happy to see the improvement in that section of the Rails to Trails route. Those who asked for a faster canoe-kayak course around the dam should be happy too. And those who like to use Argo Pond for various recreational activities should be delighted as well. Lets remember that the State of Michigan will no longer be on the city's back about the safety of the head race embankment - one less thing to worry about. I'm sorry to see there are a few lingering critics. I don't know what to say about them except that maybe &quot;lingering critics&quot; are also a tradition here. Tue, Jan 17, 2012 : 12:43 p.m.
now we just need more whitewater features and better/more flow control to those features... That WOULD be a huge draw to the area. Look at other cities that have installed urban whitewater parks. Mon, Jan 16, 2012 : 10:09 p.m.
&quot;A novel bypass was constructed below Argo Dam on the Huron River.&quot; It sure appears from the illustration that the bypass was constructed ABOVE the Argo Dam, not below it. If it were below it, wouldn't you have to go over the dam to get to the bypass? Mon, Jan 16, 2012 : 6:55 p.m.
Boating on cold water is serious business - pond, river - anywhere! The water is about 33F now and unless you're well equipped and practiced you're taking a very large risk. Besides having training and a buddy you really need a life jacket (pfd), drysuit, hood, and appropriate skirt for your kayak in this kind of water temperature - no matter where you paddle or how warm the air feels. Immersion shock and drowning by swimming failure are likely before hypothermia has an effect. Please be careful. Good cold water effects video: <a href="http://vimeo.com/4534662" rel='nofollow'>http://vimeo.com/4534662</a> UM and EMU kayak clubs conduct winter pool sessions where you can learn and practice rolling and rescue skills, and talk to people who are serious about safety. @ Rork - Flow through Barton Dam shut down on the evening of the 12th and was restarted on the 13th. All of the gates had been closed and it takes a little while for them to open, causing the fluctuation. The city improved the situation by installing an automatic backup generator and new controls at Barton, and FERC is requiring regular reports on run of the river operation starting this year, so hopefully there will be fewer of these disturbances in the future. Mon, Jan 16, 2012 : 6:46 p.m.
Is this a broad use of public funds to benefit a special interest? Have to agree with Pat. I've yet to canoe this new head-race..( too cold in case I take a spill). this could be problematic for inexperienced paddlers. Fortunately it is not real deep so when you tip over you may be OK.
Mon, Jan 16, 2012 : 6:04 p.m.
Maybe Donald Grey and Joe O'Neal, not to mention John Hieftje and the whole Council crowd could get in canoes and actually go down the new feature. When the Fire Department fishes them out, we can all chuckle at the photos. The narrow drops, which I kayaked last week with my kids (14 and 11), will swamp kayaks and canoes (as it did ours) and mangle the canoes of those not experienced enough to make the sharp turns necessitated by the currents (one drop throws you out sideways to the right, another sideways to the left). Many users will have to stop at the bottom to empty out their boats. What fun. Groups of canoes will not be able to go through the millrace as before, but rather will have to wait at a distance and go one at a time. The feature will be great for experienced paddlers; however, I'm willing to bet the majority of folks who rent are not experienced paddlers. For them, it will be difficult and, potentially, dangerous. Mon, Jan 16, 2012 : 6:18 p.m.
Thankyou for this report. I wondered, and will await other reports. River is vaguely 700 cfs lately, which is not crazy-high, but is moderately high. It did do some stupid stuff on the 12th: 140 cfs to 1400 cfs, then back to 300 cfs, then back up. Mon, Jan 16, 2012 : 4:46 p.m.
Based on the current water levels and speed of the new rapids/chutes, the tubers are also gonna love this new section. (...hint..hint..tube rental business opportunity is knocking at the door..) The site looks great, however, the exposed railroad embankment (and old hobo camp) on the opposite side could use some sprucing up. Mon, Jan 16, 2012 : 3:28 p.m. This is a great use of the voter-approved, dedicated Parks &amp; Rec millage. It's also beautiful, if you take a brisk walk down the path. Mon, Jan 16, 2012 : 4:48 p.m. Does that mean it's not so beautiful if you take a slow walk down the path? Mon, Jan 16, 2012 : 2:04 p.m.
Mon, Jan 16, 2012 : 4:12 p.m.
You're paying it (assuming you pay property taxes in the city of Ann Arbor) because I and many of my fellow citizens voted for it. The funds came from a dedicated Parks &amp; Recreation millage. I'm pretty sure the millage passed with a substantial majority of the vote. We think parks are important to the both the welfare and the prosperity of the community. They are a big part of why people want to live here. Mon, Jan 16, 2012 : 3:06 p.m. The new headrace will in theory increase revenues from boat rentals from the city. It also allows some fish passage, but just upstream and downstream are stopper dams, so I'm uncertain how much benefit that will bring. This makes keeping the dam slightly more acceptable than it would otherwise have been. Disclaim: I am still foam-at-the-mouth anti-dam. Mon, Jan 16, 2012 : 12:58 p.m.
&quot;The stability of the embankment and the adequacy of drainage measures became an issue in a controversy that arose as a result of efforts by some to remove the dam altogether.&quot; This is false, right? Tue, Jan 17, 2012 : 4:24 p.m. I took that statement as just a means to refer to the early debate between pro and con regarding the removal of the dam. 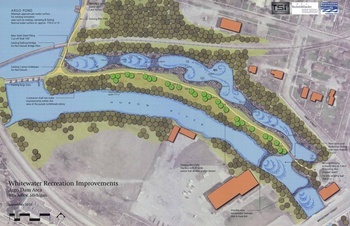 It was a talking point of the Huron River Watershed Council to justify the removal of the dam. So while the issue itself was between Michigan's Water Quality officials and the city, it was brought up by opponents of the dam (and hence, the head race improvements). Mon, Jan 16, 2012 : 10:44 p.m.
Doh, Calm Down is right. I misread the sentence. Mon, Jan 16, 2012 : 5:53 p.m. The sentence says that the controversy arose as a result of the efforts by some to remove the dam. The stability of the embankment, etc. became an issue in that controversy. Mon, Jan 16, 2012 : 4:08 p.m.
Good question. Seems the stability of the embankment and the drainage issues would be an issue regardless of whether anyone had wanted to remove the dam. Mon, Jan 16, 2012 : 12:42 p.m. I'm sorry, folks, but that is the worst-constructed headline I've read in a long time. Mon, Jan 16, 2012 : 2:05 p.m.
Yeah that's what annarbor.com is becoming known for: great writing, superb editing, and fantastic headlines. Quickly they are becoming a frontrunner for a Pulitzer Prize in 2012. Keep up the good work!